HomeThe Nintendo Switch Needs to Switch up Nintendo. The Switch was an interesting concept. A console/handheld hybrid sounded cool and the initial trailer was pleasantly devoid of any gimmicks beyond this portability. They were showing off Skyrim which suggested stronger links with third party developers and most of the actors were young adults instead of children. It looked like they were trying to market the Switch as a more matured console, still fun but aimed at the people closer to my own age who had grown up with Nintendo and still made up a massive portion of sales despite Nintendo’s drive to be a child-oriented company. Their move with the Wii U to add Bayonetta 2 to their exclusive list and include her in Smash Brothers was a step in the right direction so maybe they were learning. Some people complained about its power, saying it cannot compare to current generation consoles but I don’t really care. In fact it is laughable as a predominantly PC gamer listening to predominantly console gamers criticise the Switch’s power. If people wanted power they would buy a PC but it is the supposed ease of access, cheaper buy-in price and exclusive titles that draw people to consoles instead. I say “supposed” because consoles are increasingly taking on the negative aspects of PC gaming without any of the positive returns but that is a discussion for another day. All the Switch really needs is a good catalogue of games and its unique selling point of gaming on the go. More time has passed now though and we have been given more information and shown more presentations. By the end of the first Switch conference though my appetite for the console had been killed off completely. Suddenly we had more crappy gimmicks than we could shake a stick at, little in the way of third party support, a higher price-point than anyone had predicted and paid online services without the content to back it up. Individually any one of these things wouldn’t have been terrible but together they swiftly cut down any enthusiasm that I may have had. The way that I see it, Nintendo runs its business around three main words: Retro, Gimmicks and Children. These three things form the core of Nintendo since the release of the Wii and again aren’t inherently bad individually. The gimmicks speak for themselves with the motion controls, portable screens and the like. Nintendo try to innovate rather than rather than doing the same thing as before but with more power like with the Xbox and Playstation. I can’t really knock them for this but it feels like they try too hard to reinvent the wheel. I want to sit in a comfy chair and interface with a game in a simple way that requires little thought or effort so i can become immersed in it, not swinging my arms around, shaking my hands and flicking my attention between multiple screens. I didn’t like the Wii controls because of this so never played it beyond the handful of games designed from the ground up to use it. 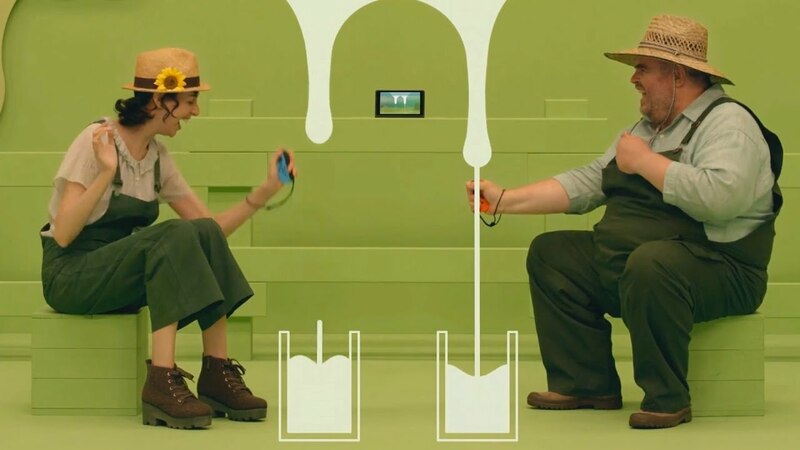 Showing off milking a bloody cow with the Joycon or making it feel like a glass of ice just makes me wonder how much cheaper the console would have been without the fancy sensors rather than making me excited to flail around like an octopus on acid. This plays into the fact that Nintendo’s core market is children. The bright colours, family friendly content and character heavy focus all tie into the fact that Nintendo see themselves as toymakers more than game/console designers.This in itself is fine, especially considering how grey and gritty the other consoles had tried to become, but it does become a problem when it gets in the way of older fans enjoyment. This can be seen in the backward stance on online multiplayer and communications, the lack of diverse games and a general unwillingness to listen to feedback. Nintendo builds and markets for children but a massive amount of their fans are now adults who still wish to play and support Nintendo products yet find themselves appeased only by the meagre offering of retro games that Nintendo dribble out again and again each generation. This leads us to the retro. A large portion of Nintendo’s audience is running on nostalgia. These are the old school Nintendo fans who love The Legend of Zelda, Mario, Metroid and Star Fox who rebuy old games every time they are re-released and eagerly await the next game in the series. Most of these are quality games too so all is good, right? Well, the trouble is that this doesn’t sell consoles or games to people who don’t have this nostalgia. As I have said, I’ve never really been in the Nintendo ecosystem other than with Pokemon so flashing a picture of Mario at me doesn’t achieve a lot. I am not going to buy a console solely because of games that I already haven’t bought the last dozen times they were release. Nintendo needs to branch out to attract new fans or they will never grow their market. And this is funny since it conflicts so deeply with their targeted market of children, a group that by definition is a constant churning mass of new audience. The Legend of Zelda: Breath of the Wild looks like a great game that I want to buy. It looks good stood upon its own merits too since I have never played a Zelda game. Unfortunately though, not a single other game has taken my fancy in the least. Third party support seems to be lacking while Mario just isn’t for me. This same kind of sentiment has been echoed by everyone that I have spoken to. For the money that Nintendo is wanting their simply isn’t the content to support it within the launch window. The sad thing is that it wouldn’t take a lot to add that appeal. There were a lot of rumours floating around about games that really would move the Switch. A console version of Pokemon Sun & Moon, (known as Pokemon Stars) is something that Pokemon fans have wanted for years and would help cement the idea of a handheld console. Releasing something like a Dark Souls collection for the Switch would have been a strong move on the third party mark too. They want to sell Switch games as “that thing you love but portable”. They could get away with selling old game ports on this premise as a side market to their main exclusives and people would be happy but there needs to be variety for this to work. As I sit here now, a few short months from when I eagerly awaited more news on the Switch, I have no drive to buy it and neither does any of my friends. Maybe we just aren’t their market. The Wii sold well but it was a hollow generation without substance that few look back favourably upon. The Wii U sold poorly and had a terrible library of games. The Switch needs to win Nintendo back some support or they might not get another opportunity. Repeat selling the same handful of games to an ageing fanbase while marketing colourful, family friendly titles to a younger audience that increasingly wants to scream obscenities down a mic while playing Call of Duty is not sustainable. Nintendo needs to switch out their business policies and get with the times. Just look at their Youtube policies to see how out of date they are with the average consumer. Both oldschool gamers and children consume massive amounts of gaming related content online but Nintendo seems terrified of losing money to let’s players or reviewers. They continue to burn bridges without building any new ones. The Switch is potentially Nintendo’s last chance to prove that they still have what it takes to compete in the modern console market. I just hope that they don’t waste it. Who wouldn’t want this cute little guy to succeed?